The judge who presided over the High Court Trial-at-Bar that convicted Former army commander Sarath Fonseka says that she had received death threats throughout the trial. Deepali Wijesundera who chairs of the High Court Judges Association (HCJA) of Sri Lanka said that she is not sure who was threatening her. When asked about media reports of threats against one of the judges in the Trial-at-bar which convicted Gen. Fonseka who challenged Mahinda Rajapaksa in the 2009 presidential election, Judge Wijesundera dissmissed the allegations saying that the fellow judge had never informed her about the threats. Justice WTMPB Warawewa who acquitted General Fonseka in the hearing popularised by the media as the ‘white flag case’ has reportedly been threatened with death following his verdict. 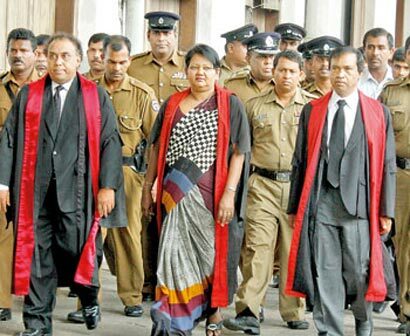 Deepali Wijesundara, and Justice Zulfikar Razeen found the accused Sarath Fonseka guilty for implicating the government in war crimes. The court ruled that he lent credence to allegations the defence secretary Gotabhaya Rajapaksa ordered Tamil Tigers to be killed as they tried to surrender in May 2009. Fonseka rejected the verdict, telling the court was it politically motivated. SF will bide his time for the day he will be released to take revenge. He is a spiteful man. He has tortured and imprisoned his fellow officers and soldiers for daring to defy his immoral behaviour with female soldiers. During his electioneering campaigns he threatened dire consequences to WW and other politicians and celebrities for speaking against him. He will now add to his list of people to be eliminated on perceived grievances the two learned judges, who found him guilty as charged on the fist count. This man should never be released. He should now be charged with high treason for conspiracy to seize power by coup d’tat, to assassinate the Hon President and his family and other politicians. When found guilty he should be sentenced to death, as in USA for treason. lessor degree may be his targets .Please be cautious. Thanks for the warning. I am always on my guard. Life is cheap in SL. Army deserters are two-a-penny, with guns for hire. They account for some of the crime, contract killings being their speciality.